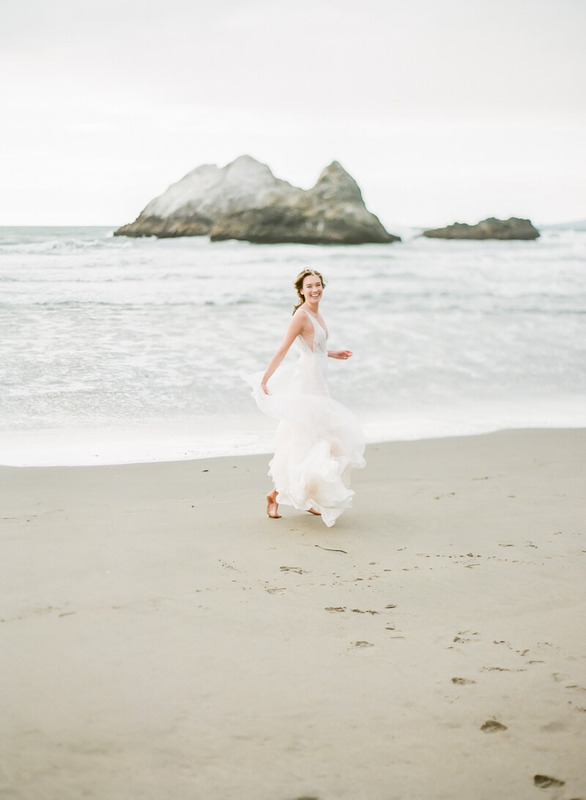 From the Olea & Fig Studio: This was a seaside mermaid inspired styled shoot that took place at the beautiful, serene and untamed Ocean Beach in San Francisco. We envisioned an intimate soiree in a breezy evening with the stunning seascape as backdrop and natural, exquisite sea inspired adornments, natural yet modern. We selected a color palette composed of a range of soft, rustic hues with a rich and mystic accent of blue, embodying the elegance and fantasy of the deep sea. The concept of layering various organic textures was utilized throughout tablescape design and floral arrangements. Muslin, fishnet and flowy cheesecloth were used to set the natural yet refined ambiance. Floral arrangements were created with flowers with similar muted tones, though each with very a distinctive texture, sprawling artfully. Another key element was the concept of elevated transparency, simple and elegant; this was applied from the chairs, glassware, and cake stand to the candle holders as well as table decor. For paper design and cake design, the same organic yet delicate aesthetics were incorporated; modern minimalism was fused with organic watercolor spills and gradient to tell this romantic tale of the sea. The sheer, flowy silhouette of the dreamy outfits portrays gracefulness, while the mix of white, ivory and grey carry that playful elements. Inspired by the celestial natural elements of the sea, soft sparkles and sheen were incorporated in the makeup, and effortless hairstyles were created with a sea glass like crystal comb and nature inspired sage headpiece. This work showcases our story of the modern mermaid.